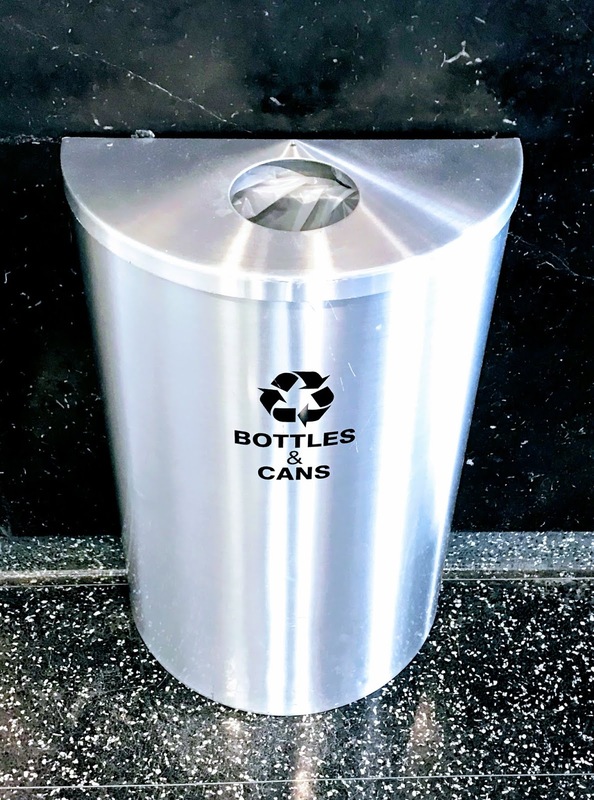 So check out this sleek garbage for bottles and cans. Like many of these, it has a small opening hole at the top to convey that only bottles and cans (like it says on the side) should be put in for recycling--no garbage. When I was walking by quickly, I took the shot, attempting to throw in my bottle. But it bounced off the rim and landed on the floor. Before I could even turn around to pick it up, I saw another gentleman behind me swoop in and pick up the garbage and put it in the can for me. I tell you that I was really quite amazed. He could have easily said, I missed the can and so I should just pick up my own trash off the floor and throw it out--that's only right! Instead, it was in his mind nothing to do this random act of kindness and he picked up my trash. I know it sounds like a nothing burger, but to me, it represented just a real decency from another human being. Not being too hoity-toity to pick up the garbage. Rather just saw something that needed to get done and doing it. I tell you that as much as some people disappoint me with their arrogance and evilness, others are genuinely good people. This is what it's all about--the good people showing the bad people what kindness, generosity, and humanity is all about. To the evil f*ckers out there--who are arrogant, materialistic takers, haters, bullies, aggressors, and abusers--to h*ll with you!